Another sauna, another shape! 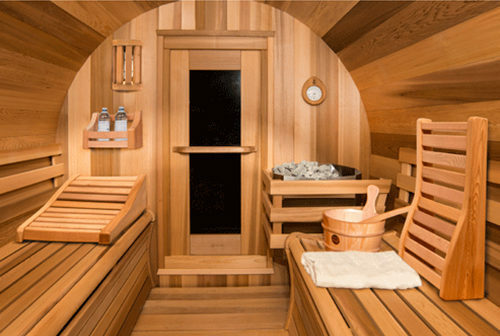 Dundalk LeisureCraft Cedar Cabin Saunas bring all the beauty, functionality and experience of our classic barrel saunas, but in the cabin format some of our customers prefer. Larger sizes come with 2 tier bench seating and bronze tempered glass in the door. The outdoor cabin saunas fit perfectly on your deck or backyard patio or on your dock. Another sauna, another shape! 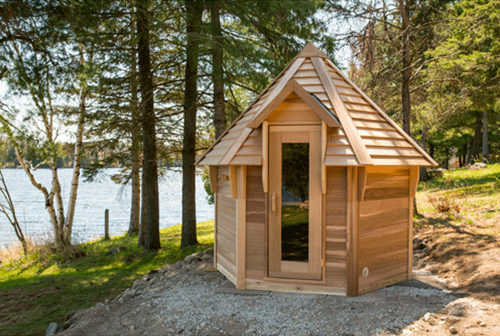 Dundalk LeisureCraft Outdoor Cabin Saunas bring all the beauty, functionality and experience of our classic barrel saunas, but in the cabin format some of our customers prefer. The outdoor cabin saunas fit perfectly on your deck or backyard patio or on your dock. Easy to assembly pre-cut sauna package. Outside feed wood burning heater. Optional Side window on 1 or both sides of door.